There are many things about my job that I love. One in particular is the opportunity to learn about and promote the many delicious restaurants found along the South Shore. One of the restaurants I&apos;ve discovered since starting with the CVA is Sage Restaurant, 157 Lincolnway in downtown Valparaiso. On a recent Saturday, Amy and I were excited to head to Sage to try some of their amazing food. Walking in to Sage, guests are greeted with a very nice atmosphere. The walls are painted - you guessed it - sage green, and the décor is tastefully done. It&apos;s a very classy and comfortable space. After being seated, we began looking over the menu. Sage offers both lunch and dinner. The lunch menu is available daily from 11 a.m. to 3 p.m., and the dinner menu is served all day. While many different things piqued my interest (I&apos;ll be back for you later, salmon), I ordered the Pasta of the Day which was made with freshly prepared pasta and a variety of seafood. Amy and our guests also ordered something off the menu; however, Chef Joe came out to offer us an excellent opportunity - a chef&apos;s tasting! The chef&apos;s tasting included six different sample-size courses of some of the best that Sage has to offer. 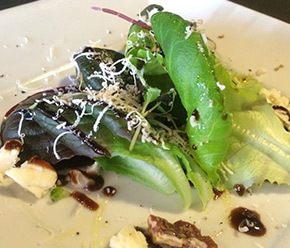 The first course was a beet salad, which included spring mix lettuce, gorgonzola cheese, candied pecans, shaved beets, and balsamic and olive oil. It was delicious! Following the salad, we were treated to the best soup that I&apos;ve ever had. It was a creamy potato soup. 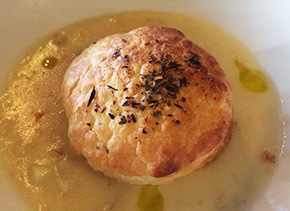 In the middle of the dish rested a house-made puff pastry crouton stuffed with potato. The puff pastry had such a delectable texture and flavor. I could eat that soup for days. The next two courses offered me some new food experiences: a sea scallop and a braised short rib. 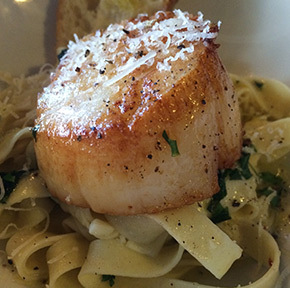 According to Amy, the sea scallop was seared to perfection. It rested atop a bed of fresh tagliatelle pasta tossed in a light olive oil. I do not kid you when I say that weeks later, I am craving this dish. It. Was. Amazing. 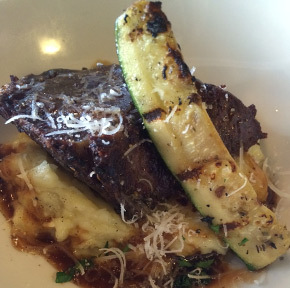 Following the sea scallop, Chef Joe&apos;s "pièce de résistance" was delivered: braised beef short rib served with a slice of grilled zucchini and creamy horseradish parmesan mashed potatoes with a mushroom demi-glace sauce. I&apos;m not sure any words could do this dish justice. The meat was tender and succulent. The grilled zucchini was seasoned to perfection. The mashed potatoes were some of the best mashed potatoes in the history of mashed potatoes. Now, if you&apos;re like me, you might have been afraid of the mashed potatoes because of the horseradish. But never fear, the flavor was the perfect complement to the short rib. Needless to say, I completely cleaned my plate. I&apos;m not going to lie, we could only compare the idea of following that dish to having to follow Michael Jackson in a talent contest, but the next dish proved to hold its own. The fifth sampling was a homemade cheese ravioli topped with a pork ragu sauce. Sage has me sold - the only way to go with pasta is homemade. The ravioli&apos;s cheese was fresh and creamy and the red sauce had a slight citrusy tone - definitely refreshing on a sunny spring day! Despite how delicious everything was that we had tasted, we were ready for dessert. 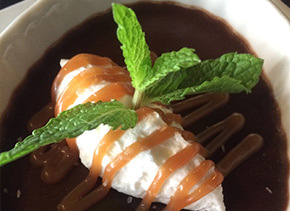 Out came two dishes of pot de crème, Sage&apos;s homemade chocolate custard, which is drizzled with salted caramel and topped with fresh whipped cream. I swear to you, I was in food heaven and I never wanted to leave. Amy is lucky I like her so much and was willing to share the dessert. All in all, we left Sage very full and very happy. The restaurant quickly became one of my favorites and I&apos;m positive it will be one of yours, too, if you go in and give it a try! Sage Restaurant is participating in "Savor the South Shore" Restaurant Week, which is going on now through April 19. Be sure to check out their menu as well as the many others featured during Savor!